Import, convert, and display Geosoft raster files with this free add-in for Esri ArcGIS Pro. Search for free geoscience datasets by keyword or location. The Geosoft Add-in for ArcGIS Pro enables you to work with Geosoft raster files (grids) within Esri ArcGIS Pro. You can convert Geosoft rasters into Esri rasters and display them in ArcGIS Pro maps and 3D scenes. Import vertically-oriented section rasters to their correct 3D locations in a single step. Search for free geoscience datasets by keyword or location. 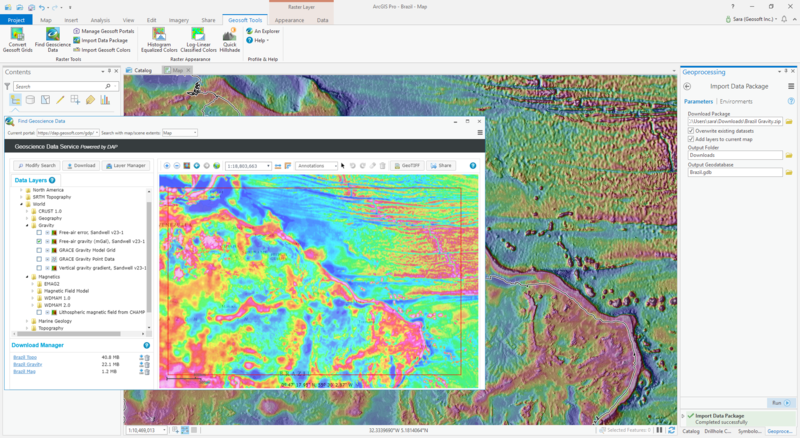 Incorporating your geophysical or geochemical raster datasets within your GIS project can add context and information to your exploration projects. Apply Interpretative visualization techniques specific to geoscience data, such as histogram-equalized and log-linear colour stretches, to emphasize specific qualities and improve your understanding of the data. 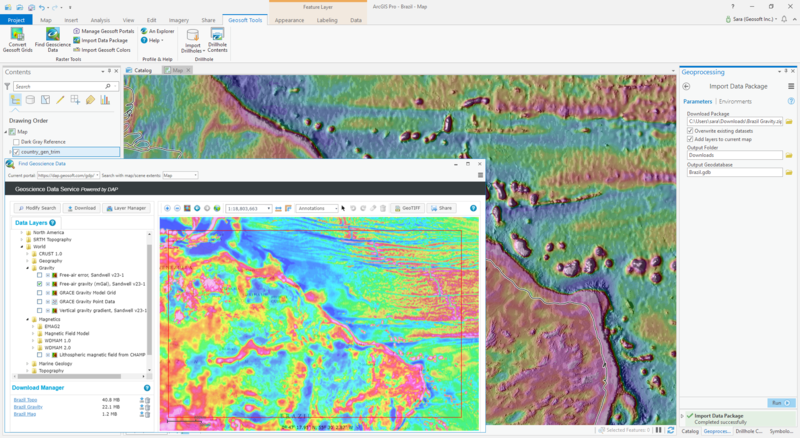 View your geophysical or geochemical Geosoft raster files (.grd) in ArcGIS Pro quickly and easily. Seamlessly convert multiple Geosoft raster files into Esri formats, then visualize, analyze or process your data with ArcGIS Pro. Apply standard geoscientific colour methods to enhance important details and make your data easier to interpret. Use a histogram-equalized colour method for geophysical rasters and log-linear classification for geochemical rasters. Quickly apply shading to selected rasters using the Esri multi-dimensional hill shading tool to give your rasters more visual contrast and depth. Import sections or subsurface rasters and easily display them in an ArcGIS Pro 3D scene with their correct location and orientation. 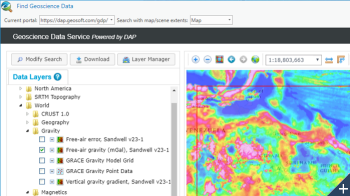 Search Geosoft DAP Servers for global geoscience datasets by keyword or location. 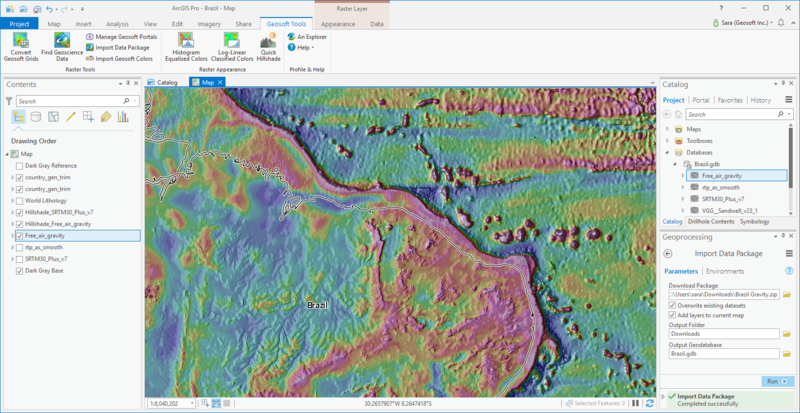 Download and display raster and vector data easily, to view, process, and analyze in ArcGIS Pro. The Add-in for ArcGIS Pro is free to use for anyone with a Geosoft ID. To start using it, just download the installer and then watch the Getting Started video to learn the basics. If you know someone who could use the Add-in, use the share link to email them. The Geosoft Add-in for ArcGIS Pro has the same system requirements as ArcGIS Pro and is compatible with ArcGIS Pro versions 2.2 and higher. The supported operating systems are: Windows 10 Home, Pro and Enterprise (64-bit), Windows 8.1 Pro and Enterprise (64-bit), Windows 7 Ultimate, Professional and Enterprise (64-bit). If you are not using ArcGIS Pro, Geosoft also provides a free Plug-in for ArcGIS for anyone who wants to view Geosoft files in ArcMap. IS220287 An abort which may occur when launching your Geosoft software, has been resolved. IS236727 The error "Failed to load system tools - Geosoft Tools.pyt" will no longer occur when upgrading ArcGIS Pro while the Geosoft Add-in is installed. IS237345 Added the ability to search for, download, and visualize geoscience datasets hosted on DAP servers in ArcGIS Pro. First update to the Geosoft Add-in for ArcGIS Pro is released. Added with this version: the ability to search for and download geoscience data from within ArcGIS Pro. Geosoft Add-in for ArcGIS Pro released as a new product that is available for free to the geoscience community.